Here’s a little secret: Not all small business owners are whizzes when it comes to accounting and financial matters. To help these struggling entrepreneurs, Yendo was developed. The financial accounting web-app can be used to manage a business’ invoices, purchases, expenses, and payments to vendors. Yendo is a full-figured app that has more features and functionalities than the average business owner might need. Check it out for yourself by signing up for a free trial. One of the first features you’ll want to check out is Yendo’s invoice management system. With Yendo, you can create and send invoices via email and then record payments or track overdue bills online. Click over to the “Sales” or “Purchases” tabs to create business reports, balance sheets, and profit/loss statements. These reports can then be exported to XLS and PDF for easy sharing with investors and colleagues. Yendo also offers a number of tools to aid in expense tracking. Rather than waiting until tax season to frantically gather business receipts for write offs and deductions, you can use Yendo to record expenses and save receipts all year long. Expenses can be separated out by employee, making it easy to see who is spending what at your office. 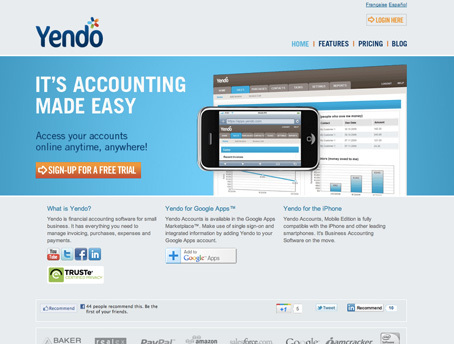 For business owners who want the tools to manage their finances online without the burden of being 100 percent in charge in case something goes wrong, Yendo offers a special feature that gives accountants and CPAs direct access to their clients’ accounts. Although Yendo faces stiff competition from competing web-apps, the system’s bevy of top-notch features and comparatively low pricing options make it a winner.